Owning very little is certainly not the only aspect of living a Tiny Life but it is certainly the most identifiable and probably the most difficult thing to overcome. I have been trying for a couple of years now to really cull my possessions. I refuse to keep clothes that don’t fit me any longer in the hopes of one day being able to squeeze into them again. I don’t keep books after I’ve read them unless they really moved me. 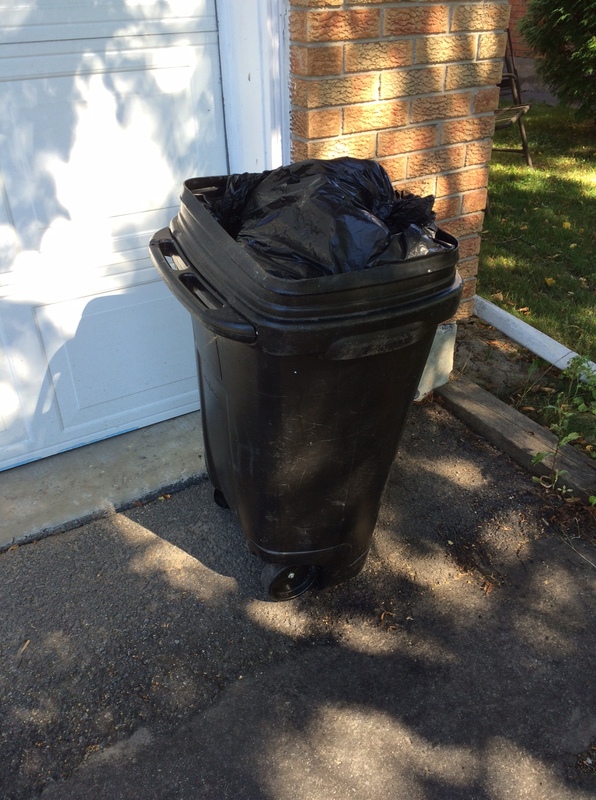 I am not a shopper and I am a big fan of getting rid of something old every time I buy something new. 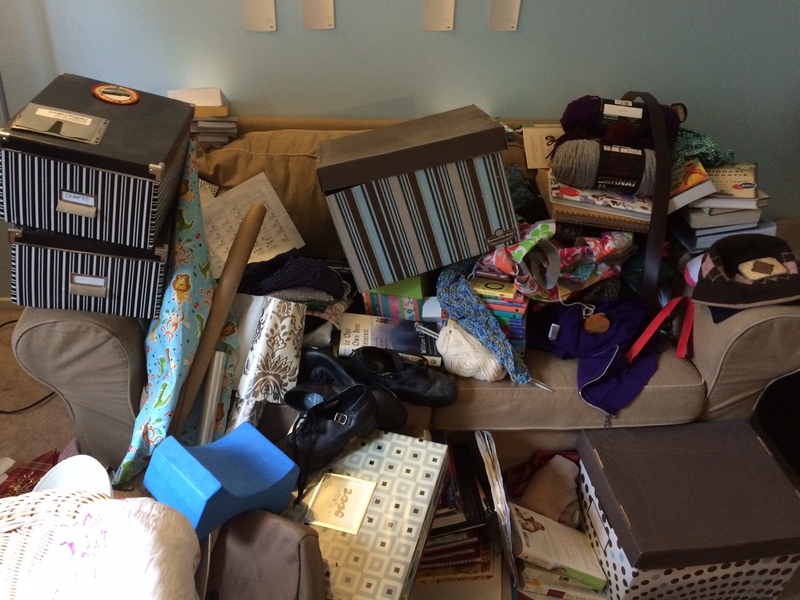 I don’t feel that I could be classified as a hoarder by any stretch of the imagination and I don’t think that my partner or I have a lot of things to begin with. Our living room at the city house is messy with bills, books and work but it’s not what I would consider cluttered with purpose-less things. I have many pretty bankers boxes that coordinate with the curtains in each room, each labelled with the contents. They are neatly stacked and sometimes even act as an end table. If you were to look at our house (and ignore the dog hair, the piles of bills, and restaurant candies strewn everywhere), you would probably say that we had an average amount of stuff and that I was pretty good at organizing it. When I wanted to move two bookshelves in the small office, I had to not only remove everything off of the shelves but clear a path to move the furniture. And the office ended up looking like this. After removing everything off of the bookshelves, I was left with this God-awful mess. Woah. What the…? Is this all mine? Where did it come from? If this were in our tiny cabin, it would take up practically the entire main room. No. No. No no no no no. A thousand times NO! This is not gonna happen. This has got to go. The problem with the above pledge is that I don’t want to let some of this go. And I’m pretty sure that if anyone else were in the same situation, they would also find it hard to purge. 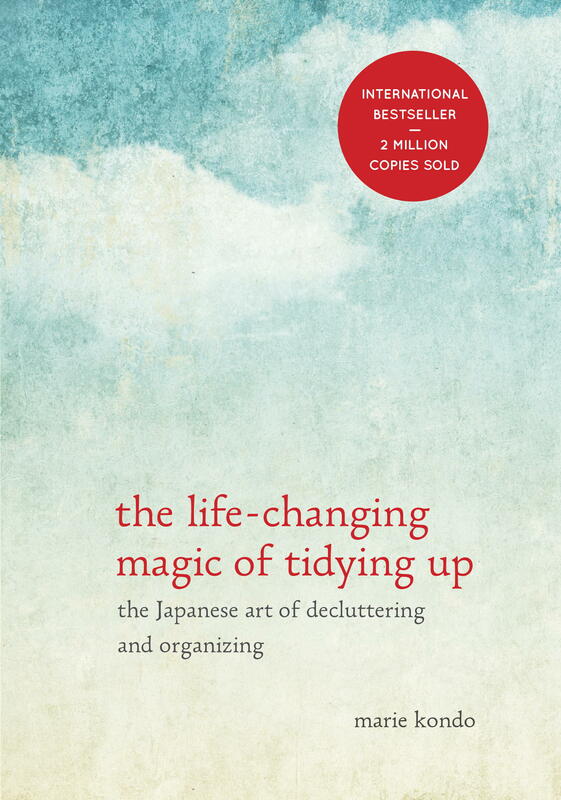 Enter Marie Kondo’s The Life-Changing Magic of Tidying Up. Mind. Blown. This woman is the guru of downsizing and tidying up. But contrary to what you might think, she’s not an organization expert. She’s a human expert. Whatever excuse or strategy any of us has ever heard or tried for keeping things, she’s heard them all and she has profound words of wisdom for each and every one of them. 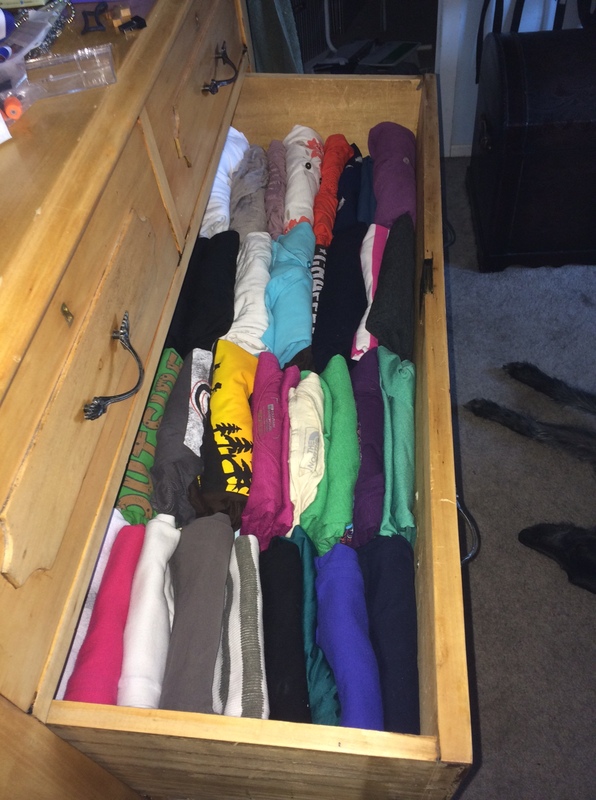 Now, you’re not supposed to stray from her method (the KonMari Method). But I did (shhhh…). You’re supposed to follow it step by step but because within the first chapter it resonated so strongly with me, I took everything she said to heart and felt like I really understood it. It was exactly the reasoning I needed to say goodbye to so many things in my house. To get the full understanding of what she is saying, you must read the book. It’s not that expensive for the wealth of reasoning in it. But basically, she says, again and again, Keep only the things that spark joy. Keep only the things that speak to your heart. Sounds a little whimsical, I know, but the statement that really hit home for me was when she was describing the process for discarding momentos – souvenirs, gifts, those objects that you are emotionally tied to. One of the main tools of this method is to actually touch everything and to feel that visceral feeling of joy. If you don’t feel joy when touching it, then discard it. (And by this she just means get it out of your possession, whether that is by throwing it in the garbage or donating it.) Again, it sounds very flighty. But it actually works. I started with my clothes, as is the first thing she recommends because people are not usually emotionally invested in their wardrobes. Remember I mentioned earlier that I don’t keep clothes that don’t fit? Well, now it was time to get rid of the clothes that did fit but I didn’t like. This was harder than you might think. But I was able to reduce my closet by half and my dresser by about two-thirds. And guess what…if you store your clothes the KonMari way, everything will fit. She gives explicit instruction on how to fold your clothing. I hardly discarded any T-shirts (because generally I only buy T-shirts that I love) but they were always a mess in the drawer. Now I can see each one and they always look tidy. And looking at things that I love, that are tidy, REALLY makes me happy. The next category is books. And she has a list of categories to go through so I won’t do that here. But I tackled that pile for two days. It was exhausting. Physically and emotionally. I threw out photos, donated my souvenirs from different countries. I posted a lot of my really sentimental items on my local Buy Nothing Facebook page (read more on that later) and gave items new, loving homes. 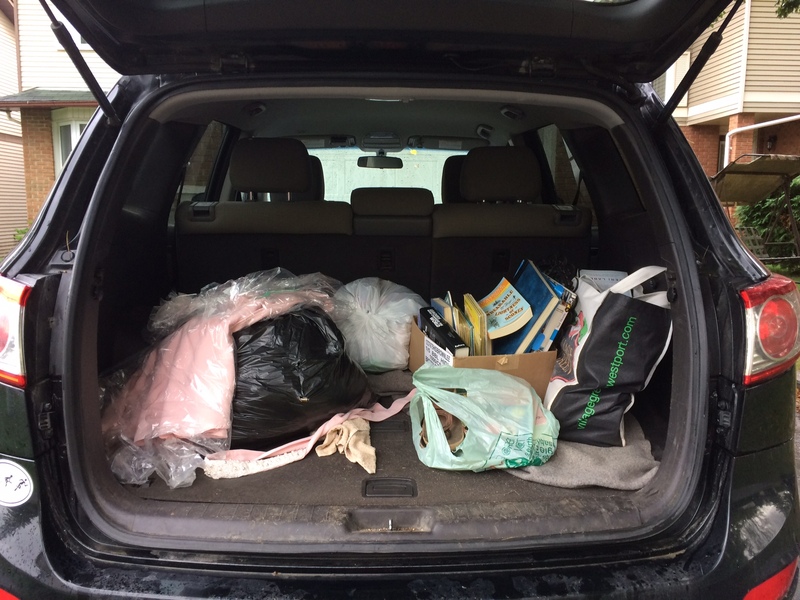 I filled the back of the SUV twice with donations and I filled the garbage bin AND the recycle bin. From just one room. This was the first load to drop off at the local donation centre. Rule of thumb for tidying up papers? Discard all of them. 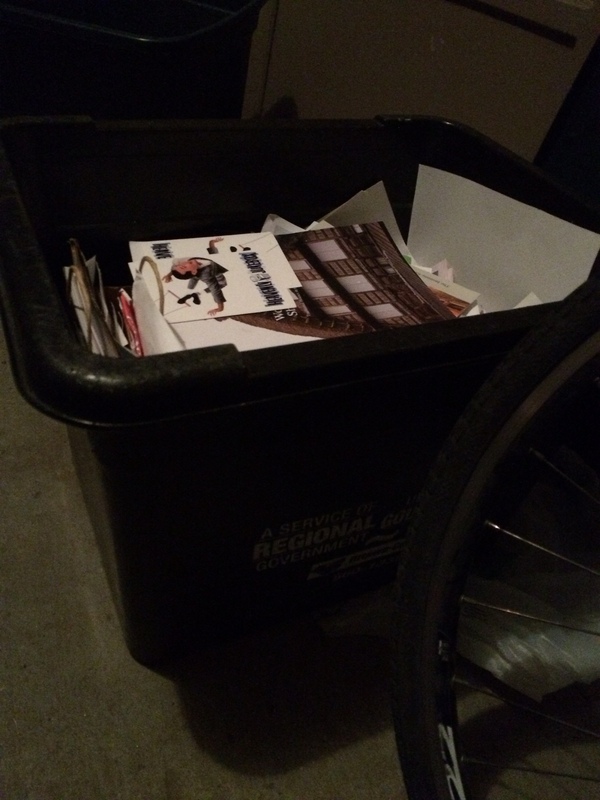 One recycle bin full. Wow. That’s a lot of garbage. Especially considering it came from one of the smallest rooms in the house. Now my office contains only those things that I love. It’s a much more manageable amount of items, all items have a home and everything that belongs together is together – sewing, photography, writing, art, knitting, hiking and my clothing. That’s it. It doesn’t even take up two bookshelves. And there is nothing – NOTHING – on the floor. All the books, save for a few, are downstairs. All of the photos are edited and in the basement. After halving my clothing, I got rid of half of my jewellry, over half of my yarn, I decided which art I wanted to continue (drawing) and gave the rest away (ex. scrapbooking, oil painting, calligraphy). If I didn’t love it, I got rid of it. Gone. Outta here. Good riddance. Now I can focus on what’s really important instead of focusing on all the trivial stuff. It’s a metaphor for life, I suppose. How do we focus on the values that are really important to us – like, living intentionally – when we are constantly bombarded by the small and menial day-to-day activities in our lives – like always trying to figure out where to put things. In a sense, it’s Maslow’s hierarchy. The fundamentals need to be taken care of before self-actualization can take place. But what if your living space takes so much time that you never get to reach your potential? In developing countries, isn’t this why girls are often left out of education? Because there’s too much to be done at home? The irony is that we here in the First World have created these problems for ourselves out of access to and excess of material goods, while in developing countries, their housework is out of necessity. If we have such an easy life, why do we make it so hard for ourselves? I sit here in the office, right now, writing this, with nothing around me but the things I love, including two hounds at my feet. Isn’t this the way life is supposed to be? Surrounded by the things you love? The only thing missing is Soldier Boy. He’s in the bedroom, prepping for tomorrow’s work day. I’m going to sign off here and head to bed myself. Good night. I know I will sleep tight. Since I learned about it, I see it everywhere too. She has a very interesting way of explaining things.